Two of the most frequently used car rental KPIs (key performance indicators) are RPD (pricing) and utilization (fleet efficiency). As is the case with KPIs most of the time, the objective is to maximize each one. A potential (real) issue, however, is to what degree one can maximize multiple KPIs simultaneously or whether there is a trade-off to be made. This article considers potential for maximizing the aforementioned KPIs based on a Monte Carlo simulation in the context of the European car rental market. Assuming a fixed fleet car rental companies generally have two levers to grow revenue, the first being an increase in pricing, i.e. charge more per day rented, the second being to rent a car for more days during a period, thereby generating a higher utilization rate. However, the outcome is dependent on certain variables, e.g. incremental revenue derived from higher utilization. Given the dynamics of the European car rental market, particularly with regards to pricing, making a trade-off between utilization and RPD seems inevitable, which is what this article will show. Does a car rental pricing curve exist? Based on a sample of quotes from major operators at major locations the answer seems to be yes. Figure 1 presents indexed RPDs (1 day = 100) for a range of rental lengths (1 to 14 days), all sourced early June with the same start date (20 June 2016) at three major European airports (London Heathrow, Paris Charles de Gaulle and Frankfurt) for five major brands (Avis, Enterprise, Europcar, Hertz and Sixt) for a compact car. While the indexed pricing levels differ between airports, the trend is similar across the board, i.e. a rather steep daily decline in RPD for rentals with a duration of 1 to 7 days, flattening out from there onwards. Are there any particularities at individual airports? 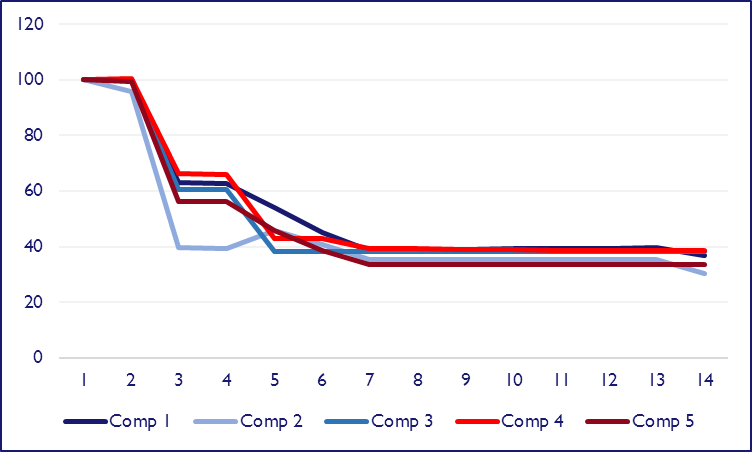 Figures 2 to 4 show the pricing curve of the sampled operators at each airport. As can be seen, for London Heathrow and Frankfurt, the operators follow each other reasonably closely, whereas at Paris Charles de Gaulle there is more disparity with a couple of real outliers and exceptions. As a controlling factor an alternative sample has also been considered. 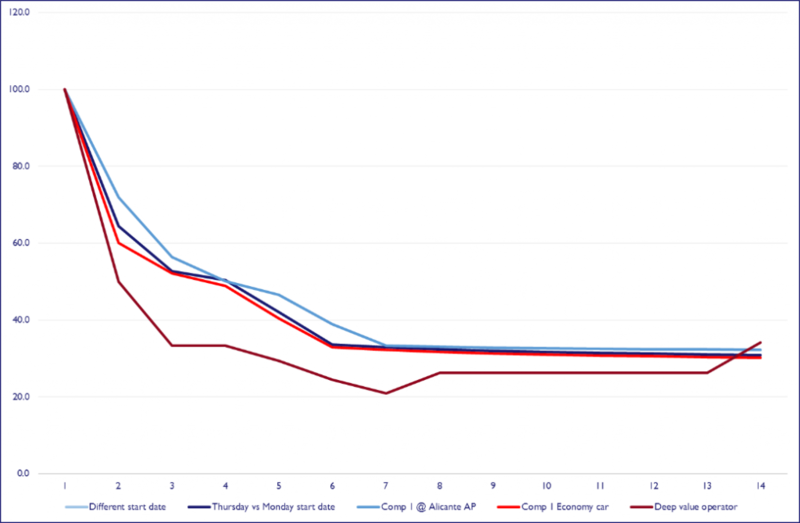 This looked one of the operators for a different start day (Thursday vs Monday), a different period (start date 19 September 2016 – note: line not visible in chart as exactly the same as for Thursday vs Monday scenario), a different airport with a somewhat different profile (Alicante, more leisure focused), a different car class (Economy). Finally, the pricing curve of a deep value operator (intentionally not cited) at Malaga Airport was also looked at. The curve of the alternative sample is found in Figure 5. As can be seen, the alternative sample by and large directionally confirms the findings of the main sample, which suggests that RPD trends in the European car rental industry, at least on-airport, everything else (car class etc) equal, follow a certain pattern based on rental length regardless of geography, day of the week of the rental etc. Once more, it should be kept in mind that this does not look at pricing levels, only the relative movement in RPD based on rental length. Accordingly, this is not to say that pricing in absolute terms is always the same, only that there seems to be a reasonably established relationship between RPD levels and the rental duration at any given time. What are the implications? Figure 6 summarizes the RPD and utilization rates assuming all transactions for a car in a given year were to be of a particular length between 1 and 14 days (utilization calculated based on 365 days in a year, 350 available rental days assumed (15 days of service, maintenance etc) and 1 day to turn around car between rentals). 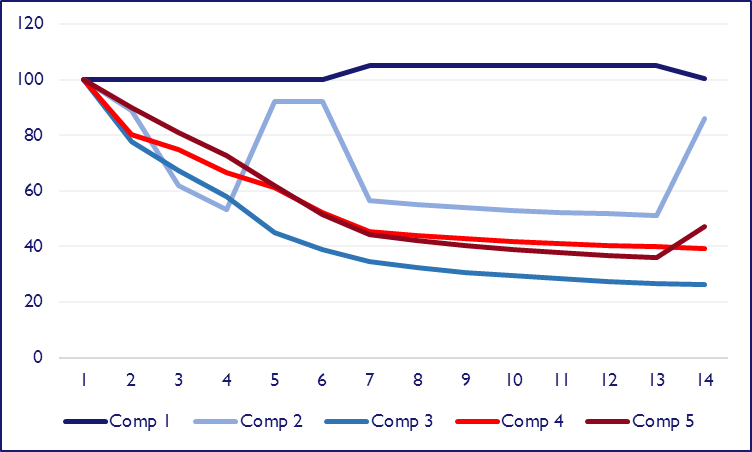 One can easily see that based on the available pricing curve, there is a negative relationship between RPD and utilization. As such, maximizing both KPIs is pretty much impossible and a trade-off has to be made between maximizing RPD and utilization. Assuming a fixed duration for all rentals is obviously a very simplistic and theoretical scenario as it is very unlikely that all rentals throughout a year will be of equal length. In order to consider a more realistic case, a Monte Carlo simulation has been conducted, the findings of which will be discussed next. In order to verify if there is a trade-off to be made between the car rental KPIs RPD and utilization in a scenario where all rentals are not of equal length, a Monte Carlo simulation has been performed. The analysis uses the previously described pricing curve data, which is assumed to be representative. The simulation considers the annual performance of a car, which can be considered a proxy for fleet. 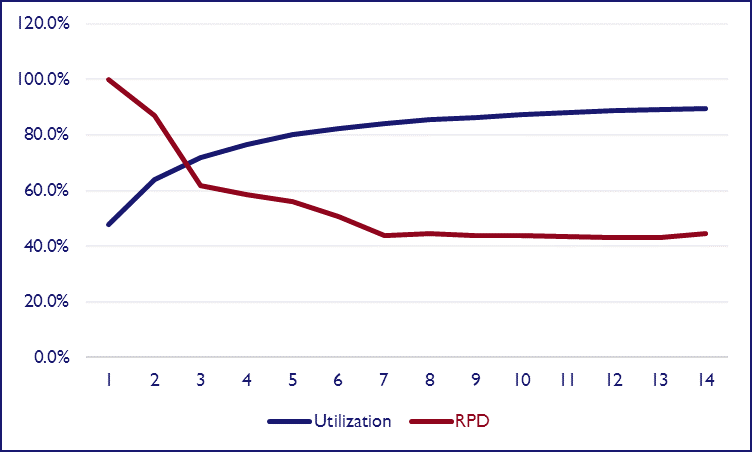 The outcome of the simulation is that, as seen in Figure 7, there is clearly a negative relationship between utilization and RPD, i.e. 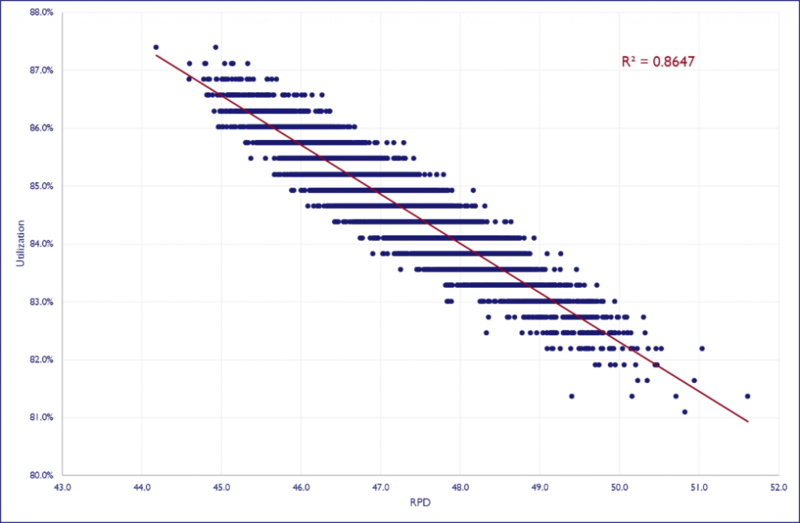 a higher utilization rate implies a lower RPD and vice-versa. Intuitively this is not a surprise as “friction”, i.e. turnaround time between transactions, favors longer rentals to reach high utilization levels and the previously discussed pricing curve shows that longer rentals on average generate significantly lower levels of RPD everything else equal. This exercise provides evidence that one has to make a trade-off between the car rental KPIs RPD and utilization, i.e. with regards to maximization it is a question of either or, clearly not both. Soft market pricing has been one of the major issues facing the industry in recent years and a variety of potential causes have been provided, e.g. by listed operators such as Avis Budget and Hertz. Without going into detail with regards to what is behind the pressure on pricing across the car rental industry (not the topic here), it is worthwhile to take a look at recent developments at the operators, e.g. with regards to business mix and segmentation. 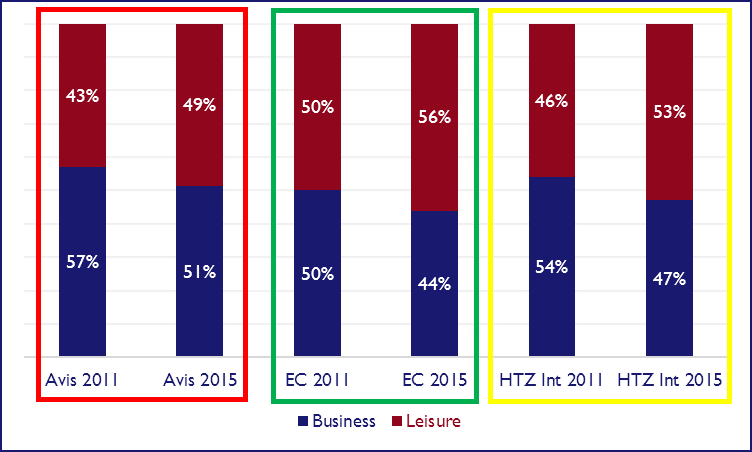 Figure 8 summarizes the business mix measured by revenue as reported by Avis, Europcar and Hertz International in 2011 and 2015. As can be seen, there has been a real shift from Business to Leisure at all operators. Hertz in its 2015 annual report state that “Leisure rentals, generally, are longer in duration and generate more revenue per transaction than business rentals”, the interesting part of the sentence is with regards to rental duration. Admittedly most Business rentals are made on fixed, pre-negotiated rates, but if one puts this aside for a minute, the growing importance of Leisure as a segment means that an increasing amount of revenue at the major operators is generated further out on the pricing curve, i.e. with rentals of a longer duration, which, as seen previously, negatively influences RPD. With regards to utilization, Europcar has seen an increase in utilization from 74% to 76% over the same period and Hertz International has gone from a 76% utilization in 2011 to 78% in 2015. The improvement in utilization rates suggests that this may have been a priority for operators in recent years. To conclude, operating a car rental business is a complex affair with a number of moving pieces. Two frequently used car rental KPIs are RPD (pricing) and utilization (fleet efficiency) and as seen above, in the context of the pricing structure of the European car rental market, there is a clearly trade-off to be made between the two. 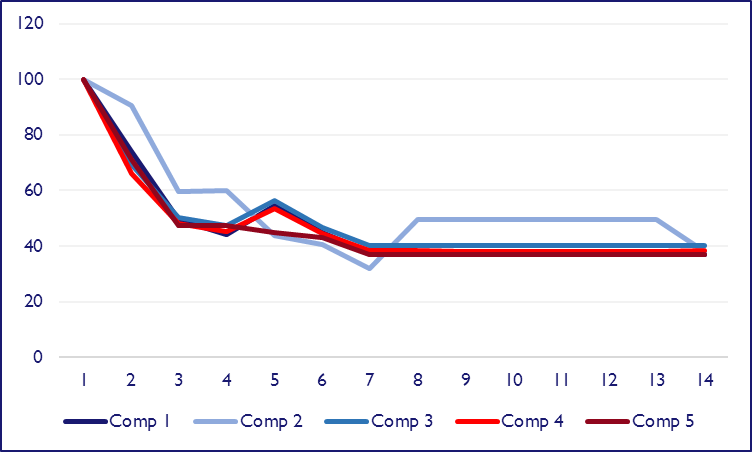 These findings are based on certain simplifying assumptions, but the evidence of an improvement in utilization rates coming at the expense of RPD seems beyond circumstantial. Accordingly, for industry operators there does seem to be a need to make a choice in terms of focus as with regards to maximizing RPD and utilization, it seems to be a case of either/ or rather than both.